He claimed that his only aim was “to benefit the royalty, my country, and the Buddhist religion.” But many others, especially those in power, thought he was a nut and a “Man of Great Nuisance to Society”. In 1909, Narin Phasit has risen from commoner origins to become governor of a province at the young age of 35 _ no mean feat in the absolutist era. Discovering the province riven with banditry, he proposes a campaign of suppression. His superiors oppose him vehemently. He defies them, succeeds spectacularly and is rewarded with a medal and royal audience. He defies his superiors again by attacking a foreign monopoly on river transport and is dismissed from government service. He launches a competitive ferry service and is soon financially ruined. This descent from rising star to destitution is prelude to an extraordinary career as the unofficial court jester of modernising Siam. He forms a Buddhist Society. The Supreme Patriarch lends support and the first issues of its journal enjoy a wide readership. But the authorities become wary when Narin wonders why Siamese Buddhism is so rotten that it has led scarcely anyone to enlightenment. Patronage dwindles. Narin fires off letters to the king, ministers and senior officials. He writes press articles complaining about their failure to reply. He publicises the causes of individuals who have fallen foul of the state. He publishes fat books detailing his exploits. He pens pamphlets criticising Siam’s involvement in World War I. He announces his plans to be ordained. The authorities have no idea how to deal with him. His views are infuriating, but not illegal. In 1916, King Vajiravudh concludes Narin is “unhinged to the point of being totally out of control.” In 1917, he is jailed for two years. On release, he is ordained but quits after three months, railing against the ignorance of the monkhood. He starts a business selling medicinal alcohol (ya dong) and makes a rapid fortune before the government outlaws his product. With the proceeds he builds a seven-storey temple on the banks of the Chao Phraya River and tries to donate it to the religious authorities. The female monks are arrested. Narin’s eldest daughter Sara resists and is forcibly defrocked and jailed. Narin publishes another long book with photos of these dramatic events. On release, Sara and her colleagues don robes imported from Japan, and Narin announces a new order of monks. Later she takes up residence in a temple in Saraburi and becomes greatly liked by her monastic colleagues. Narin ordains himself and plans to go overseas as a religious envoy but is forestalled by official intervention. Narin welcomes the political change of 1932. He fires off letters and pamphlets to the new politicians, proffering plans and offering assistance. Phraya Phahon invites him for a chat but without consequence. Undeterred, Narin sends off proposals to amend the draft constitution, a grand plan to eradicate theft, and invective against the Ratchupakan tax, a remnant of the old system of head tax and corvee. He is soon frustrated by the lack of response. He compiles more fat books and fierce pamphlets and hawks them around the streets of the capital. He is arrested and jailed. He promptly goes on hunger strike but is dissuaded by a sensitive intervention by Phraya Phahon. On release he founds the Society to Assist People in Overcoming Their Barbarian Craziness and plans to stand at the first democratic elections in 1937 but is distracted by other pursuits. In 1936 he launches an attack on General Phibun Songkhram, then minister of defence, for authoritarian tendencies _ an extraordinarily predictive insight. As the emerging political army starts to laud King Naresuan as a symbol of military heroism, Narin pens a subversive variant contrasting Naresuan with the contemporary army leadership. Narin also celebrates the historic role of King Taksin, anticipating a historical revision of a generation ahead. But as he persists in his attacks on Phibun, he is beaten up on the street by hired thugs, and sent to jail and “military indoctrination camp” for a total of five years. Despite his advancing age and these constant blows, Narin is unfazed. In a desperate attempt to save Siam, he founds a new association dedicated to the millenarian belief in the Future Buddha, and makes contact with international networks devoted to universal peace. In 1948, he stands for election in Bangkok, winning a majority in every polling station but one where a continuous ring of soldiers votes throughout the day, determining the result. Two years later, he dies. This is an extraordinary and rather beautiful tale. Narin was part of the public world that emerged with the spread of education and growth of the city in the early 20th century. But while most critics concentrated on political and social reform, Narin specialised in confronting the powerful with truth questions. 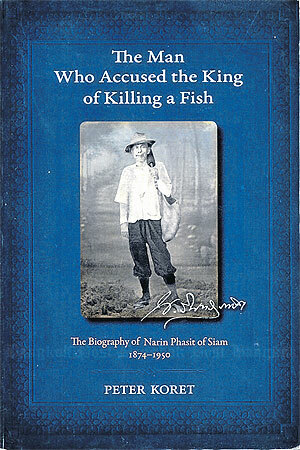 The title comes from an incident when Narin criticised a fishing trip by King Prajadhiphok in Japan as “illegitimate and against all conventions”. Narin’s constant criticism of the rotten state of the monkhood had a large element of truth but was embarrassing for those who wanted religion to form one of the three pillars of the new nation-state. His arguments for female ordination had strong logic but challenged one of the pillars of patriarchy. King Prajadhiphok accused Narin of “seeking a name for himself in a wildly inappropriate manner”. In truth, Narin seems to have been uninterested in popularity. Yet he clearly attracted sympathisers who appreciated either his ideas or his persistence in defying authority to present them. The style of Peter Koret’s account varies between biography, novel and 18th-century essay. He liberally imagines the thoughts and motives of Narin and his antagonists in the key scenes. He engages the reader throughout like a voiceover commenting on the action. It’s a high-wire act which may entertain or infuriate. Koret tells us nothing of Narin’s life prior to the opening scene when he is aged 35. This gives the tale a certain coherence, but seems mean given that we readers are bound to be curious. Still, that’s a minor criticism of an unusual, revealing and highly entertaining book.